Is there anything more comforting than a good big bowl of pasta? I struggle to find anything else more satisfying than a steaming hot bowl of pasta filled with my favourite things. I’ve been making this chicken and chorizo pasta for years and I don’t know why I haven’t shared it with you before now. It wasn’t until someone asked me for the recipe and if it was on the blog that it dawned on me to share it with you. So apologies friends, I feel like I’ve deprived you slightly. So, this is one of those meals that I cook all year round and it’s a real family favourite in our house. I hope you enjoy it as much as we do. Good quality chorizo is really important for this pasta dish so do try and get the best you can lay your hands on. I tend to steer clear of very spicy chorizo when I make this as my daughter and husband aren’t very keen on very spicy food so a good regular chorizo will do the job for this. I usually opt for chicken breast fillets for this recipe, thinly sliced, chicken thighs would work well too though. 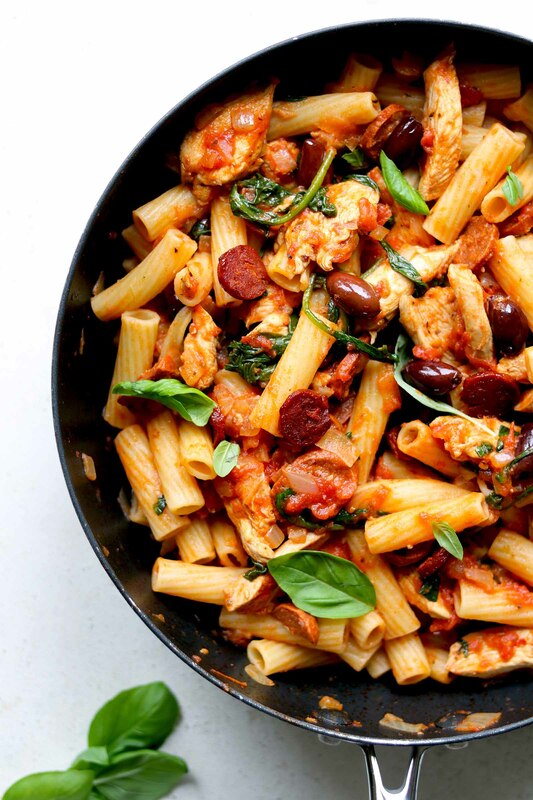 Kalamata olives added close to the end of cooking add an extra layer of flavour to this chicken and chorizo pasta. And because I never miss an opportunity to sneak in some greens I add spinach at the end of cooking too. I like a chunky pasta for this recipe as it can hold up to the sauce. The pasta needs to be strong enough for this sauce especially with all that chicken and chorizo. Rigatoni is my pasta of choice usually for this but penne or fusilli works well too. And if you’re feeling all healthy then a good wholewheat pasta will also work well here. This sauce is my favourite! It’s rich and flavourful with a little hint of smoky spice. I use smoked paprika to complement the chorizo and that gives this sauce a lovely smoky flavour. The oil that you get when you cook the chorizo is like liquid gold and gives this sauce a deeper layer of flavour so don’t ditch it. I start this sauce off with onion, garlic, dried oregano, smoked paprika and a little pinch of chilli flakes. Then I add the chicken, cook that up a bit then add the chorizo. Once they are cooked I add the tomatoes, I usually add some water to the empty can give that a little swirl around and pour into the pan too. It all cooks up very nicely, then when the pasta is almost done I add the spinach and basil. The spinach may seem like a lot but don’t worry it will wilt into the sauce. Finally, add the pasta and carefully toss it into the sauce so all the pasta is covered by the sauce. Big bowls are a must for this chicken and chorizo pasta, as is a generous shaving or grating of parmesan cheese. Some freshly cracked black pepper will finish this off. Now if you are feeling extra hungry or greedy I can also recommend adding some good crusty white bread to soak up any leftover sauce. This may have happened in my house on more than one occasion. This chicken and chorizo pasta is perfect for making ahead or as part of a meal prep, it keeps well overnight in the fridge and is great for bringing to work as a packed lunch. You can eat it cold or heat it up in the office microwave. A very tasty, satisfying chicken and chorizo pasta dish with spinach. Easy to make so perfect for a weeknight dinner. Heat the olive oil in a large saute pan, add the onion and cook over a low to medium heat for about 5 minutes. Add the garlic, oregano, smoked paprika and chilli flakes and cook for a minute. Now add the chicken and cook over a medium heat until the chicken is cooked, add the chorizo and cook for another 5 minutes until both the chorizo is slightly crispy. Pour in the tinned tomatoes, add a little water to the can, give it a swirl then pour that in too. Add the olives, salt and pepper, reduce the heat and simmer for about 10 minutes. Meanwhile, cook the pasta according to the packet instructions. Drain when done. When the pasta is almost ready, add about 3 tablespoons of the pasta water to the tomato sauce then add the spinach and basil, check the seasoning then add the drained pasta. Gently toss the pasta in the sauce, serve immediately with plenty of grated parmesan and freshly cracked black pepper. Calories are approximate and do not include extra cheese or bread, maybe forget about the calories for this one. The serving sizes are for 6 people however if you are feeding a hungry crowd then so you may find this will easily feed 4 very hungry people. If you don't have kalamata olives black olives work well too. And if you are not keen on olives you can leave them out, this dish will still taste great without them. Prefer your chorizo on the crispy side? Dry fry your chorizo in a pan until it is crispy then add it with the oil to the sauce when you add the tomatoes. Yes, you can make the sauce a day ahead of time, leave out the spinach and basil and keep it in the fridge until you are ready to use it. Heat the sauce in a large saucepan and add the spinach and garlic before you add the pasta. You can freeze the sauce, it may separate a bit when defrosting but will come back together when you reheat it. Again leave out the spinach and basil before freezing. This will last for a month in your freezer. Ooh that looks gorgeous – one of those pasta dishes that looks effortlessly simple but is actually packed with different flavours, textures and colours. Perfect showstopper supper! Wow this is just bursting with flavors. I adore olives in my pasta and with this sausage in it really must be tasty! I agree, there’s nothing more comforting than pasta! This one looks so flavourful and tasty. I absolutely love chorizo!!! I love that you paired it with chicken and of course pasta!!! I am so ready to dig right in!! What a delicious sounding pasta dish. I LOVE chorizo….and this combination is just popping with lots of great flavoaurs.